Welcome to a new year fully energized and with new opportunities. As we have done last year, we will try to guess what 2008 will bring us on Wearable Electronic activities and products. We love all the Interactive Fashion that has been launched in the market, the choice was never as broad as it is today, price wise and function wise.The iPod Fashion contributed the majority of the products ranging from Jackets to all kind of bags and last but not least found a use in pillows. The large range of companies with an even larger range of styles let us assume that this segment, the iPod enabled Clothing and Bags, are well covered. The choice for consumer is wide and diverse. Haute Couture Tech Fashion has further explored the merge between the emotional factor of fashion with the â€˜coldâ€™ element of technology as we could see the creations from Hussein Chalayan or Bogner. The comforting and dynamic element of light added to textile products like clothing, bags and home decoration was another area in 2007 that got attention from companies launching the first textile based products that emit light. New textiles for fabric based heating elements in clothing have been further developed and lead to more than ever advanced heated clothing as we have highlighted in our recent product introductions to keep and stay warm during the cold winter days. Textile sensors for the sports enthusiasts got a make over with the addition of new styles and more diverse systems at very reasonable costs as NuMetrexÂ® has demonstrated in 2007. What we didnâ€™t see coming was the hottest trend of 2007 in the Wearable Electronic segment: Solar Fashion. Solar bags have been around before but just a few and to give due credit, Voltaic was one company that has been there in a consistent position. But somehow the time was right and the technology, flexible solar panels, available to enable designer and companies to fully embrace this opportunity to give a very sensible (for the environment) and practical (for our growing power needs) function to our bags. Our expectations for 2007 have been met if not exceeded so what do we expect for 2008? Itâ€™s difficult to make predictions for this year, at least from our perspective. for once, iPod enabled clothing and fashion bags will continue to expand if the addition of this function does not add significant costs. Light emitting clothing and fashion accessories have a great appeal but most of the designs available now are either for advertisement, safety or party gear. More street style fashion would be desirable to be come available. 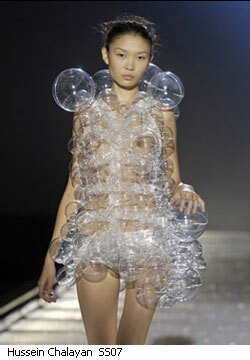 One area we are very sure off is the further expansion of Solar Fashion. The practicality of having additional if not to say unlimited power makes this product segment a red hot tip for 2008 as well. What we will do in 2008: restless looking for new Wearable Electronic products and introduce them to our reader. Our mission is to be there for any question you have around Wearable Electronic and Interactive Fashion. And we will intensify our DIY efforts to explore new ideas and to enable our readers to make their own creation of Wearable Electronic Fashion.